Our strawberry patch is a gift from the gods! Every day, we get a large bowl full to munch down and freeze. I think that every child should grow up with an organic strawberry patch. It is like a candy store for natural kids. Yesterday, my daughter and her friend were squealing with delight as they found the sweet delectables. 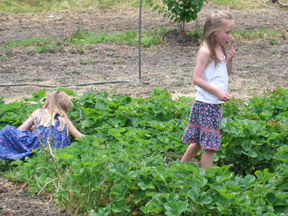 The strawberry patch also provides entertainment for my little ones, while I toil away in the garden. It is important to buy/grow organic strawberries, as strawberries receive the most pesticides of any crop grown in America, and 90% of commercially grown strawberries test above safe levels of pesticide contamination. Also, strawberries are highly allergic, thus my midwives always recommended children under one year of age abstain from eating them. My favorite way to eat strawberries is raw from the garden; however, occasionally I feel inspired to create a dessert. This weekend’s Weekend Grub on Green Options was my recipe for Old Fashioned, Organic Strawberry Shortcake. One of my earliest childhood summer memories is of strawberry shortcake; however, it was always made with spongy, store-bought shortcake. I never much cared for the soft, fluffy shortcake, but I thoroughly enjoyed the strawberries and cream. When I made the shift to organic eating and later wanted to provide my children with the same strawberry summer pleasure, I could not find an organic readymade shortcake in the local coop. In my searches for a recipe, I discovered that traditional strawberry shortcake is not made with an airy cake but sweet biscuits. The first time I tried strawberry shortcake made with biscuits, the taste reminded me of a time when people milked their own cows and had small family farms. I felt like I was sitting in a midwestern farm house eating a treat made by my great grandmother. Strawberries are such a wonderful treat and I look forward to them each summer. I didn’t realized that they soaked up so many pesticides. 🙁 I do have a small container garden and one large container is taken up by my strawberries. And while there is an abundance of flowers and berries coming in, I know that I’ll only get a few. The pesky children get to them before I do. LOL That looks like a good recipe for strawberry shortcake. Thanks! I love strawberries and they’re just in season! I’m going to buy some at lunchtime and eat them later with some organic cream! Your patch sounds great both for the strawberries and for your children!